“Ghost Ship 0.5%” is an aromatic and fruity pale ale with caramel and tropical fruits in the aroma and flavour. Find out how it’s made, plus get tasting notes, ingredients and key nutritional info including calories, carbs and sugar. If you love your alcohol-free drinks, you might be wondering why so few traditional breweries are producing low-alcohol and non-alcoholic beers when the popularity of alcohol-free drinks seems to be growing by the day. It’s true that more of us are swapping normal-strength beer for alcohol-free brews. Yet these still only account for about 1 in 100 of all pints drunk in the UK. So it’s a still a small market for a product that often demands specific expertise and resources to get right. Hence why it’s the specialist low and no alcohol start ups like Nirvana, Infinite Session and Big Drop that are leading the way. Meanwhile, traditional breweries that have entered the alcohol-free market are producing mixed results when it comes to brewing non-alcoholic beer. Adnams, a mid-sized regional brewery based in Suffolk, recently launched an alcohol-free beer to go alongside its full-strength range. Unlike the traditional breweries like St Peter’s, Brewdog, Leeds Brewery and Thornbridge that have dabbled with non-alcoholic beers, it chose to make an alcohol-free version of a current beer rather than concoct a brand new one. 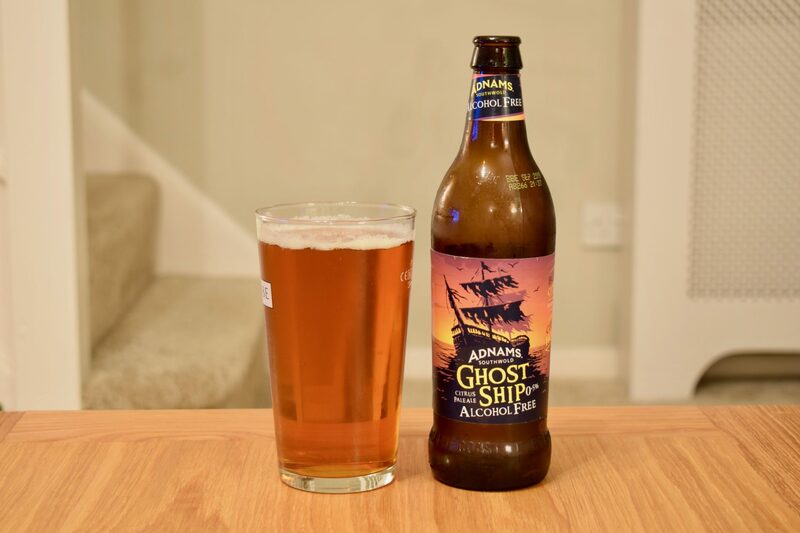 The result is “Ghost Ship 0.5%”, a low alcohol version of its popular pale ale of the same name. 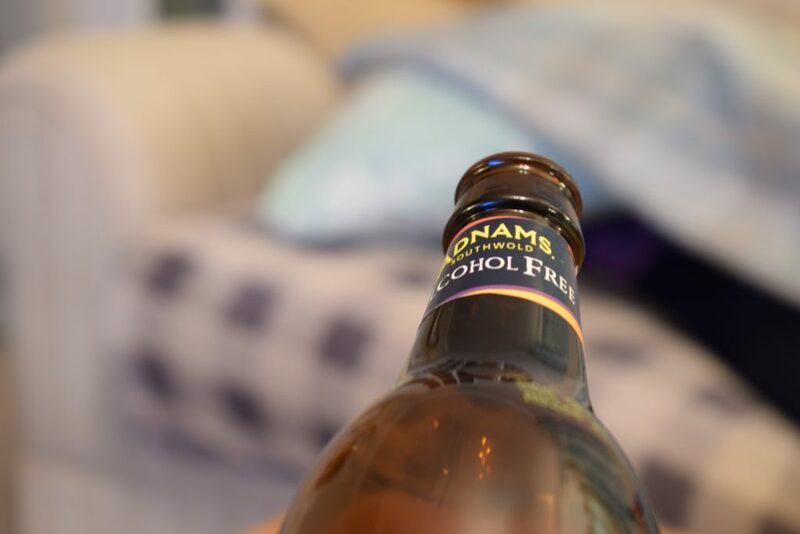 And it really is the same beer – unlike breweries that halt fermentation early or use a yeast that doesn’t produce much alcohol to make their alcohol-free beers, Adnams takes the full-strength beer and filters out the alcohol. Of course, there’s a bit more to it than that with lots of tech and science involved in removing the alcohol without negatively affecting the flavour. The beer is also dry hopped, which normally means more hops are added after fermentation, presumably after the alcohol is removed in Ghost Ship’s case. Otherwise, it’s the same as its alcoholic sibling, made with locally grown malt and Cascade, Chinook and Citra hops. Like the 4.5% version, it’s pretty easy to get hold of, either on tap in one of the brewery’s 70 pubs or in can and bottle in many major supermarkets. It’s already won a bronze medal in the World Beer Awards’ low and no alcohol category. Ghost Ship 0.5% pours a tawny-amber colour and looks like a classic bitter in the glass. It’s lightly carbonated for a bottled beer, so only has a slim head. But it leaves a satisfying trail of lacing down the glass as you sip. The tropical fruit aromas – possibly mango – from those hops hit you full on instantly. There’s also a little citrus in there and a little caramel, which borders on being savoury. It goes surprisingly well with the tropical aromas. Although lightly carbonated, it’s much fizzier than a cask ale as you’d expect. But it doesn’t feel gassy. The body’s good and could easily rival a full-strength beer for mouthfeel. There’s some rye in the malt bill in this beer, which could explain the pleasant dry finish that leaves you wanting to drink a little more. On tasting, there’s a touch of fruitiness in the flavour, which combines well with the tropical fruits in the aroma. However, this is overpowered by the high bitterness that seems to get more intense the more you drink. A little more caramel flavour from the malts and a little more sweetness would have been more welcome. But there’s still enough variety in the flavour to keep things interesting. 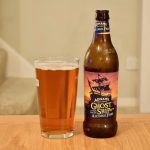 Ghost Ship 0.5% is a solid non-alcoholic beer, with a lovely aroma and body and a decent flavour. It might even appeal to drinkers seeking a non-alcoholic alternative to an English bitter, despite the US-influence on the hop front. 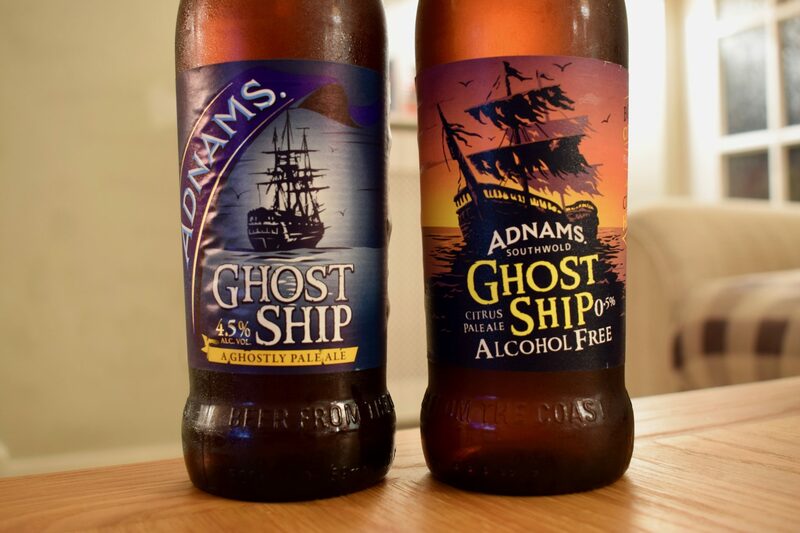 You could even argue that it’s just as good as, if not better than, the original bottled Ghost Ship – I struggled to tell the difference when I did a comparison. The main difference is the smell, with the alcohol-free version showcasing more intense aromas, possibly due to more hops being added after alcohol removal. Those hops also bring more bitterness to the alcohol-free beer, making up for the subtle bitter taste that alcohol brings to the original Ghost Ship.